One of our Port Royale apartments Los Cristianos, this nice little studio is on the 1st floor. It has been tastefully refurbished in a modern style. This is one of our Port Royale apartments Los Cristianos. It is a spacious 1st floor studio. The living area has a sofa bed, coffee table and TV. There are patio doors which lead out to a nice little balcony with patio table and chairs. The bedroom area has 2 single beds and large fitted wardrobes. There are bedside tables and lamps for reading. 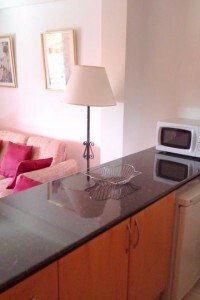 The kitchen is well equipped with a coffee maker, toaster, kettle, hob, microwave, fridge etc. The bathroom has a walk-in shower, wash hand basin and WC. A highly recommended restaurant in Los Cristianos, Tenerife. 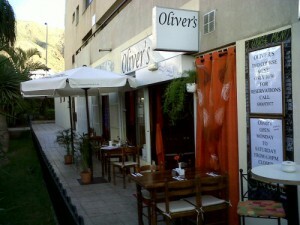 Olivers with a Twist is a very highly recommended restaurant in Los Cristianos, Tenerife. It is rated no 1 out of 296 restaurants in Los Cristianos, according to TripAdvisor and has been awarded the Certificate of Excellence on this site. But be advised you will need to book early, as it is a very small restaurant, only 11 tables and it is very popular. Some people book as far in advance as 3 months, though a few weeks ahead should generally be sufficient. The starters on the menu include Thai fish cakes serviced with sweet chilli dipping sauce; home-made pate with toast, chutney and salad; soup; black pudding and boiled egg with twisted soldiers. Main courses include fillet steak; pork fillet; chicken; shin of beef or pork wrapped in parma ham served with whole grain mash, red cabbage, broccoli and carrots. You could order the tasty board for pudding which consists of 4 small portions of different desserts on a board to share. What a good idea if you can’t make up your mind what to order! There are also different set meals including a two course meal for €18,95 per head. 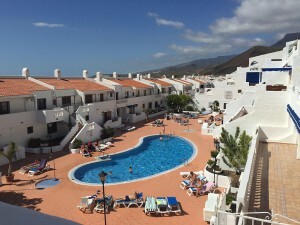 Chandon is a two bedroom two bathroom apartment to rent in Puerto Santiago, in the South of Tenerife. It has air conditioning and free wifi internet access. This two bedroom apartment to rent in Puerto Santiago has the benefit of free wifi internet access, air conditioning and satellite TV. The lounge is very spacious with comfortable seating and a dining table and chairs. Patio doors lead out to a large balcony which has a large table and 6 chairs for alfresco dining. The master bedroom has a double bed, as as well as access to the balcony. The 2nd bedroom has bunk beds. There are two bathrooms, both of which have baths with showers overhead. There is a separate kitchen which is fully equipped with a full oven, ceramic hob, extractor fan and washing machine. 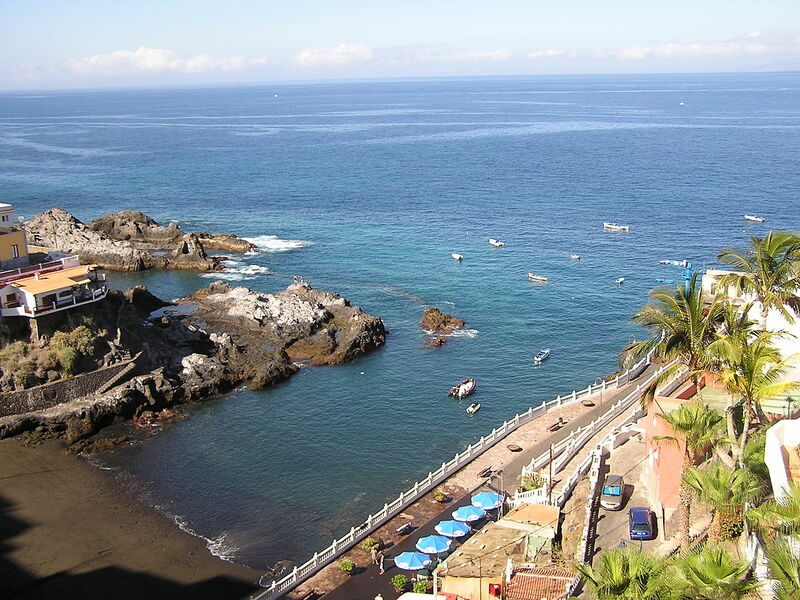 Puerto de Santiago is situated on the West coast of Tenerife in between Los Gigantes and Playa de la Arena, both of which are in walking distance. Puerto de Santiago is a small fishing town with white washed houses perched on a hillside which leads down to a small black volcanic sand beach (see left). It is really rather quaint, but as the beach is so small, a lot of people prefer to walk to Playa de la Arena which is only a 10 minute walk away. There is a fishing museum in the town as well as restaurants and bars. The Playa de la Arena beach is the holder of a Blue Flat (since 1989). 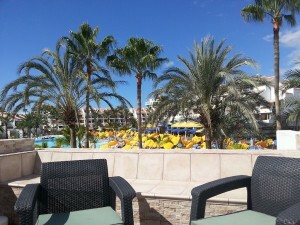 It has a couple of beachside restaurants as well as sun loungers and sun parasols for hire. There is also the beach at Los Gigantes which would be a 10 minute drive. There is a diving centre here, as well as water sports and a marina. One of our modern three bedroom Corralejo holiday villas to rent. The villa has a private pool, as well as modern conveniences such as a washing machine. Villa Livia is one of our Corralejo holiday villas to rent. It has been fully refurbished in a modern and tasteful style. Outside there is a private pool surrounded by sun loungers. There is also a covered terrace and a patio table and chairs for alfresco dining. An outdoor shower has also been provided. The spacious lounge has an L-shaped sofa, flat screen TV, as well as a dining table and chairs. Patio doors lead out to the pool and sun terrace. There are three bedrooms. The master bedroom with double bed has an ensuite bathroom. The second bedroom has a double bed as well and the third bedroom has a quaint sofa bed/futon arrangement. There is a second bathroom shared between the second and third bedrooms. The modern kitchen is fully equipped with a washing machine, full oven, microwave, full fridge freezer as well as a ceramic hob and chimney extractor fan. A small village 10 minutes drive from Corralejo. Lajares is a small village just 10 minutes drive from the centre of Corralejo and 5 minutes drive from the famous lagoon beaches of El Cotillo. There is also ‘lucha canarias’, which is a form of wrestling, which is very popular in the Canaries. Or you can watch the local women embroidering and making lace in the lace shop ‘Artisania Lajares’, which is open from 9am to 7pm on weekdays and from 9am to 1pm on Saturdays. Next to the church in the Southern part of the village are two windmills. One of the windmills, ‘Molina’, was in use up to 20 years ago and the owners still live there. Three bedroom holiday villa to let in Corralejo, in the Natural Park Las Dunas area. The villa has internet access. Villa Edonis, a holiday villa to let in Corralejo, Fuerteventura, has three bedrooms and can sleep up to 8 people. It has been fully refurbished in a modern, light and airy style. We can highly recommend it. 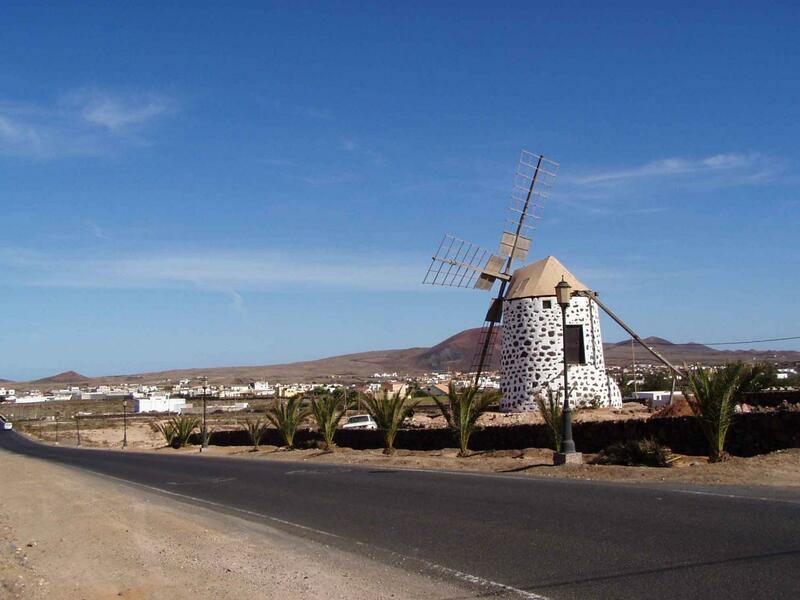 It is situated in the Natural Park Las Dunas area and is close to lovely beaches. The lounge is spacious with an L-shaped sofa, satellite TV and a dining area with table and chairs. The master bedroom and second bedroom both have double beds and the third bedroom has bunk beds. There is one family bathroom and a separate WC. Outside the villa has a private pool and sun terrace with sun loungers. A covered terrace area is provided with patio table and chairs for alfresco dining. 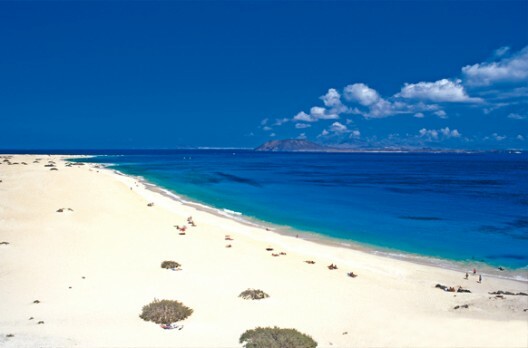 The famous dunes are a 30 minute walk from the centre of Corralejo. El Jable the 24 squared kilometer area became a Natural Park in 1982. It is a 30 minute walk from the centre of Corralejo, or you can drive an park on the side of the main road, the FV-1, which runs alongside the sand dunes. The sand is light and very fine and the beach stretches for 7km. You could almost consider yourself in the Sahara desert – it looks very similar. However, bear in mind there are no lifeguards here. The beach has red flags which means that it can be dangerous to swim here. However, on the plus side the waters are very clear and the bottom is free of rocks, which makes it a very pleasant swim. If you a hungry there is a snack bar on the beach. You can also hire lounger chairs and sun umbrellas for 3 euros each. The dunes here are constantly moving and changing here on a daily basis, due to the strong winds. 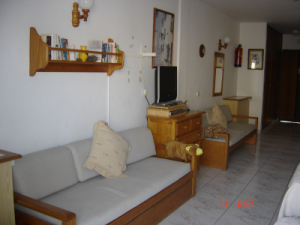 A studio to rent on Marina Primavera in the Torviscas area of Tenerife. The apartment can sleep up to 4 people with 2 single beds and 2 sofa beds. This studio to rent on Marina Primavera is situated on the ground floor and has garden views. The balcony has patio furniture with garden views. The studio is spacious with two sofa beds and a flat screen TV. There are two single beds in the sleeping area. The kitchen has a tall fridge/freezer and a 4-ring hob for cooking. There is also a dining table and chairs. The bathroom has a bath with shower overhead, a wash hand basin and WC. 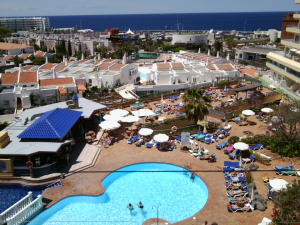 Located in the heart of Playa de las Americas, Tenerife. The largest shopping centre for clothes and fashion is in Santa Cruz. Outlets here include Mango and a recent addition since March 2014 is the low cost fashion store Primark. 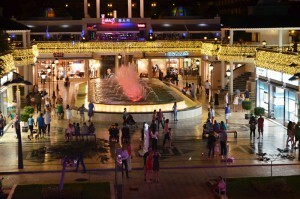 The Safari Centre (pictured left) in Playa de las Americas includes a mixture of designer boutiques as well as popular high street fashion outlets such as Zara. Originating in Spain, this outlet can now be found all over the world. The clothes are classy yet affordable. 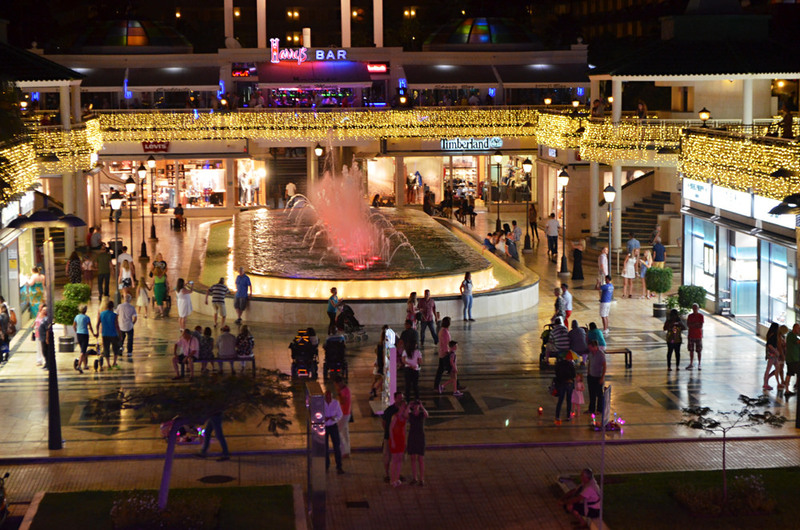 Another shopping centre in Tenerife is the El Mirador Shopping Centre in the Playa del Duque area. It is a little like shopping in a typical Canarian village, in the way it has been designed, with its narrow streets, which open into little squares where you can sit for a while to relax. The emphasis is on independently owned shops rather than chains, so expect to find quality goods offered with traditional service. There is a artisan market which runs every 1st and 3rd Sunday of each month. Local artists and craftsmen come to offer their wares, dressed in traditional costumes and with local musicians who entertain the shoppers. To top it all there are restaurants and cafes where you can enjoy refreshment. A newly refurbished Parque Santiago III studio for rent with a pool view. The studio is very comfortable with all the modern conveniences, such as a washing machine. This Parque Santiago III studio for rent has been new refurbished to a very high standard. The terrace has a pool view and is well furnished with comfortable chairs, sun loungers as well as a patio table and chairs. Inside the studio, the living area has a sofa, satellite TV and a dining table and chairs. The sleeping area has 2 single beds and a tall fan. The kitchen is very well equipped with a full oven, ceramic hob, as well as a fridge and microwave. The bathroom has a shower cubicle, wash hand basin, WC and a washing machine. 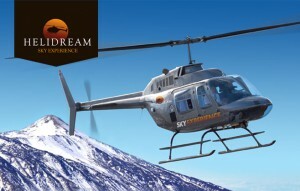 Helidreams offer helicopter tours across Tenerife. Surely it must be the best way to see the fantastic landscapes of the island. There are several tours on offer including their VIP tour. This takes you over the Teide volcano and the surrounding national park. The volcano is capped with snow in the Winter and is the highest peak in Spain. Then to the wine growing area of the Orotava valley followed by Puerto de la Cruz. The helicopter takes you over the alpine area of Vilaflor next and you will get to see the lava tongues at Santiago de Teide from the last eruption in 1909. Another tour is Low Island where you can enjoy the amazing landscape and have lunch by the sea. You will get to see the combination of the green of the North with the seascape of the South of the island. You will fly over the coastal village of La Caleta, then on to Alcala and Playa San Juan with their golf courses and hotels. Get to see the giant cliffs of Los Gigantes from the air which you will find spectacular. Next comes the magnificent landscape above Buenavista with mainly ochre and green colours and extensive lava tongues. The tour next takes you to Garachico and Icod de los Vinos where you can see the Millennium Drago tree which is over 1000 years old and lastly to the El Teide National Park and the Corona Forestal. A two bedroom apartment to rent on Compostela Beach with pool view. The apartment has been refurbished with a dishwasher and washing machine. This two bedroom apartment to rent on Compostela Beach has a large terrace with a pool view. The apartment has been fully refurbished and well equipped. The kitchen even has a dishwasher and there is also a washing machine in the apartment. The lounge is comfortable with a sofa and 2 armchairs. There is a flat screen TV. There is wifi internet access available on the complex. The two bedrooms both have two single beds. The bathroom has a bath/shower, wash hand basin and WC. A special nature reserve located just outside the town of Adeje. 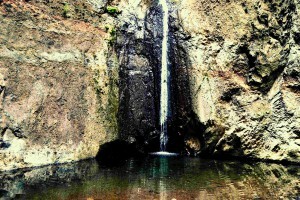 The Barranco del Infierno is a special nature reserve located just outside the town of Adeje. Only 300 people are allowed per day in order to conserve the plants and wildlife in this area. There are special guided hiking tours which take place from Monday to Friday. The trail takes 3.5 hours and starts 300 metres above sea level. The views are amazing. The Reserve is also home to many predatory birds such as the sparrow hawk, raven, eagle and the common hawk. There are also small owls, canaries, Moorish partridges, robins, single-coloured swifts, hoopees and turtledoves. At the end of the trail there is a magnificent waterfall, as seen in the photo above. It is over 200 metres high. The name “Barranco del Infierno” means “Hells Gorge”. This lush green ravine is the only location in the south of Tenerife with natural running water. There are a lot of caves situated here, which are thought to have been home to the Guanches in ancient times. It is therefore a very important area for archaelogical reasons. A collection of Guanche mummies and utensils were found here. A studio with sea view on Orlando Tenerife. The studio has been refurbished with a double bed and comfortable sofa. 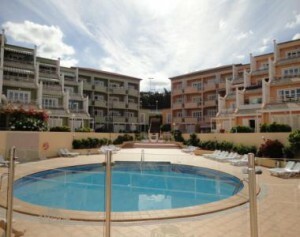 This studio with sea view on Orlando Tenerife is situated on the 5th floor. The views are outstanding from the balcony which has patio furniture including table and chairs. The studio has been fully refurbished. The living area has a double bed with sofa and flat screen TV. There is also a ceiling fan. The kitchen includes a ceramic hob, fridge, kettle etc. The bathroom has a bath with shower overhead, wash hand basin, WC and also a washing machine. 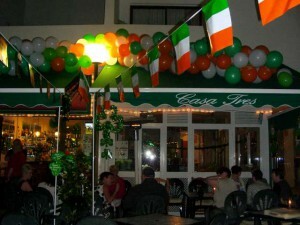 An Irish pub situated below the Sunset Bay Club in Torviscas. Micky O’Malleys is an Irish pub situated below the Sunset Bay complex in Torviscas. Therefore it is conveniently located for the Orlando complex, which is very close by. The bar was opened in 2007 by Micky and Marina. Newcomers to the bar will be surprised by Micky, perhaps expecting him to have a broad Irish accent. But infact, although Irish through and through, he was brought up in England and has a London accent. Marina does the cooking and is very personable and chatty. She is very welcoming to all the customers. The bar serves food during the day, up to around 6pm in the evening. The full English breakfast is very well spoken of. Some people say the poached eggs are the best in Tenerife. The Sunday roast is also very popular and the rib eye steak very well praised. The portions are very generous but there are also items on the menu for lighter eaters and OAPs. On TripAdvisor the bar has been awarded with a Certificate of Excellence and has been rated no 5 out of 175 bars and restaurants in Torviscas. One of our one bedroom apartments to rent on Orlando Tenerife. It is on the 4th floor with excellent sea views. The apartment sleeps up to 2 people. Orlando 15 is one of our apartments to rent on Orlando Tenerife. It is situated on the 4th floor and enjoys excellent sea views. Having been fully refurbished, it is a highly recommended apartment. There is a double bed in the bedroom which also has a flat screen TV. The lounge has a sofa as well as a large dining table and 4 chairs. The modern kitchen includes a hob, fridge, kettle and toaster and the bathroom also has a washing machine. An Irish restaurant serving international dishes in the grounds of Sunset Bay. Casa Tres Restaurant is situated in the grounds of the Sunset Bay Club complex in Torviscas in Tenerife, which is of course very close to the Orlando complex, featured above. It is a highly recommended Irish restaurant serving an international menu. Having been awarded a Certificate of Excellence on TripAdvisor, it has some very good reviews. Many say that the prices are very reasonable (a 3 course set menu for example costs just €12.95 per person) and that the portions are very generous indeed. There is also nightly entertainment provided. The restaurant is open daily for breakfast, lunch and dinner, but please note the restaurant is closed on Mondays. The menu includes dishes such as pasta, meat-based meals such as Beef Wellington and lamb cutlets, fish dishes and vegetarian options. Choices for breakfast include pancakes, veggie breakfast, the ‘big’ breakfast or the Irish breakfast. There are also various options with toast. For lunch there are a range of delicious snacks available such as healthy salads, burgers, toasties and garlic bread. 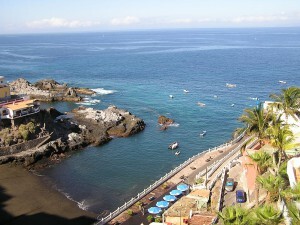 A studio with sea view on Santa Maria Tenerife. Situated on the 5th floor with pool views as well. There is satellite TV and air conditioning. This studio with sea view on Santa Maria Tenerife is situated on the 5th floor and as you see from the photo to the left also has fantastic pool views. Infact the view couldn’t get much better! The apartment is very well equipped as the owner has installed air conditioning. There is also satellite TV with English channels as well as a DVD player. The apartment can sleep up to 4 people, as there is a double sofa bed, in addition to 2 single beds. A lovely little Italian restaurant in the San Eugenio area. This lovely little Italian restaurant is rated no 2 out of 174 restaurants in Costa Adeje, according to TripAdvisor and has been awarded the Certificate of Excellence on this website. The many good reviews mention fabulous food and great service from the waiters and staff. The wine and cocktails are also very good and sensibly priced. Be sure to go with the address (see above), as the taxi driver may not know exactly where it is – it is a little gem! A bit on the expensive side, but according to most reviewers on Trip Advisor, well worth it. The chef specialises in Italian cuisine. Starters include tapas, prawns in brandy, bruschetta mix and calamari. For main courses you could try the sea urchin spaghetti, venison, home made pasta with frutti di mare, seafood lasagne with parma ham and spinach, lobster risotto, ravioli or fillet steak. The puddings are also very good and include profiteroles and panna cota.